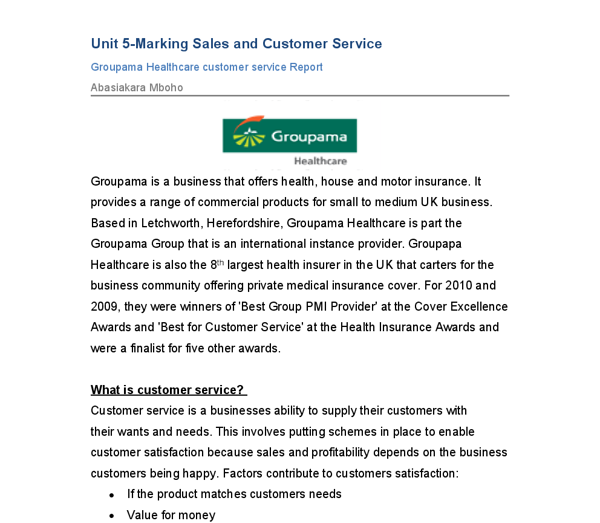 ﻿Unit 5-Marking Sales and Customer Service Groupama Healthcare customer service Report Abasiakara Mboho ________________ Groupama is a business that offers health, house and motor insurance. It provides a range of commercial products for small to medium UK business. Based in Letchworth, Herefordshire, Groupama Healthcare is part the Groupama Group that is an international instance provider. Groupapa Healthcare is also the 8th largest health insurer in the UK that carters for the business community offering private medical insurance cover. For 2010 and 2009, they were winners of 'Best Group PMI Provider' at the Cover Excellence Awards and 'Best for Customer Service' at the Health Insurance Awards and were a finalist for five other awards. What is customer service? Customer service is a businesses ability to supply their customers with their wants and needs. This involves putting schemes in place to enable customer satisfaction because sales and profitability depends on the business customers being happy. Factors contribute to customers satisfaction: 1. If the product matches customers needs 2. Value for money 3. Efficiency and reliability of orders 4. Professionalism and expertise of employees 1. Customers Groupama Healthcare works with variety of customer both internal and external customers. Such as, hospitals, brokers, employees, businesses and general people who need medical cover. 1.1 External Groupama Healthcare has found a niche in the market that is small to medium business consisting of 30-50 employees. This is because they do not have the resources for bigger business. They provide their services to smaller businesses because the profit margin is bigger when selling too small to medium business than selling to big business. Therefore, they can charge a higher price for health insurance. For example, in a big business because there are more employees more people would make claims and Groupama would have resources to pay out the claims for this degree business. Moreover, because bigger health insurers such as Bupa offer their services to bigger business it has left a gap in the market for Groupama to target small the medium business. ...read more. However, business should not focus on price to attract customers because there is always a business out there that will beat it. Product: Just as with price is not worthwhile for a business to focus on their product because with innovating technology, business can improve their product more and more. Also, in the insurance market business offer close to the same product which makes it hard to standout from competitors. Quality: The quality of delivery is important for Groupama because they cannot compete with product of price. It is essential for Groupama Healthcare to offer a superior product against their competitors. They are more likely to have a higher quality of product those large companies such as Bupa because they have a smaller amount of clients. Therefore, there is less workload so they can put more effort into offering excellent customer service. This is an advantage because it decreases the amount of complaints and lessens the chance of getting negative publicity. Service: If business focus on their product or price other sectors of their business could suffer such as customer service such as speed of delivery. It?s important very important that a business like Groupama Healthcare is quick, efficient and make the customers their first priority. Customer service takes countless years to build and develop unlike price and product. However Groupama have found a balance with price, product and service enabling them to attract and retain customers. The graph to the left shows that Groupama retains it at least 80% of their customers. 4.2 Reducing complaints and negative feedback When a customer is dissatisfied with customer service, they are likely to make a complaint. In the case of Groupama Healthcare, a compliant could be due to the way a customer?s was treated or the lack of quality and speed of the product. For example, Groupama Healthcare states that is take 9 day to turn over a quote. ...read more. Exercises such as team building can help improve communication and develop trust. In addition, training enables employees to develop their skills and gain experience in their fielding of working. The more experience the quality and speed of the product is increased therefore better customer service. With self-development, employees are unable to find their weakness or develop their strengths. This could cause poorly motivated employees which will affect the customer service. If this frame work in carried out appropriately this will increase the standard of customer?s service and reduce complaints and negative feedback therefore attracting new customers because they have received good publicity. 1. 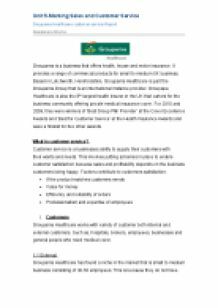 Improvements for Groupama Healthcare Despite Groupama?s award winning and successful customer service, there are areas which can be improved. For example Groupama always operate over the phone. An advantage of this is that it?s more cost effective, efficient and quicker for the business and its customers because clients don?t have to make the journey to the business. However, some customers may prefer meeting face to face especially for sensitive issues and it?s easier to explain processes such as procedures they go they go through to make sure a claim is genuine. They are also more likely to develop and relationship between the client and their as reduced chance of their being any mishap to confusion in the process. This will be beneficial to Groupama because customers would be more likely to stay with the business. 1. Benefits of customer service For four years Groupama has been recognised for its excellent customer service. In 2011 they have been winners of Best customer service Health Insurance 3rd year running, On-line intermediary service ? Health Insurance and Cover Award for Best Service. By winning these awards helps Groupama continually attracts customers by word of mouth and they get a high level of repeat customers. Being bathed in awards and very high customer retention rate of 80% due to excellent customer service is obviously a benefit for Groupamam Healthcare. With having a high number of repeat customers and new customers is always beneficial for a business because it mean then can make a profit. ...read more. To satisfy the needs of stakeholders e.g. to improve shareholders with financial returns an increase our market share The second aim and objective of Sainsbury's is to ensure that the needs of their stakeholders are met. Sainsbury's currently has a market share of 16.3% and is number three in the UK for 2008. CSR Groups and Location Pragati - Bangalore The Volunteers are actively involved in providing additional support to government schools on weekends. They exploit the skills and experience of retired school teachers in Bangalore to assist them in their efforts to provide free education for children in government-sponsored childcare centres and orphanages. This has become a recently occurring issue for businesses as the government are increasing laws on the way that businesses deal with waste from the business and the emissions they produce. This is because in recent years people are becoming more aware of the effect that waste can have on the environment and the effect that is causing. For the last few years the London is the hosting international sports. The Olympic Games have been hosted in London in 1948. London is hosting the particular game called as the tennis every year at the fantastic village called as the Wimbledon among all the popular international games.